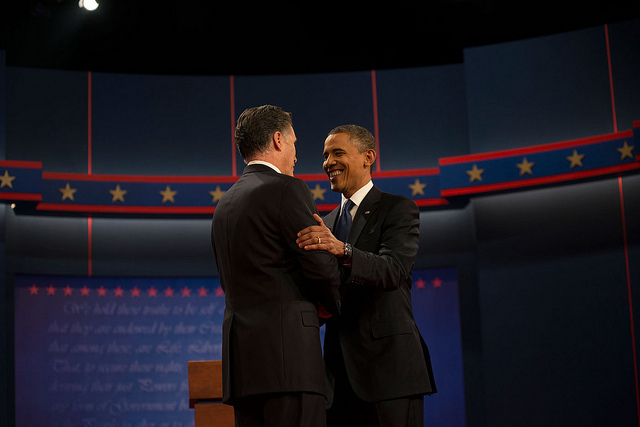 Barack Obama and Mitt Romney at the October 3rd debate. Photo by Scout Tufankjian for Obama for America. 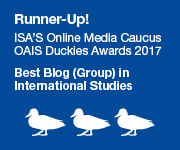 Over at The Monkey Cage, John Sides has a timely post on the influence of debates on the outcome of US presidential elections. Despite the media frenzy, intensive practice, and partisan spin that surrounds these debates, the reality is that they rarely have any effect on elections’ final outcome. Nada. So here’s my question: if debates really don’t have significant effect, why bother? Most candidates are competent debaters, so usually no one dominates the debate and approval rates don’t change. However, debates still takes place, b/c there is a small number of really incompetent or uninformed candidates (e.g. Sarah Palin), and if you refuse to debate with your rival then you send a strong signal to voters that you are a below-average candidate. So candidates debate. There are candidates who could afford to refuse a debate w/out hurting their reputation, those who are already known to be highly competent/informed. But now those candidates have an incentive to *invite* others to a debate b/c they know that they are highly competent and they can actually win a debate against a low-quality or even average candidate. Participating in a debate is like saying “how are you” to people at work. It is a low-cost gesture that does not signal a genuine interest in others’ well-being. If you *don’t* say it, however, the absence of this low-cost gesture signals that you are a really rude person, you care very little about others. So we say “how are you” to everybody and they just say “fine” even if they are not and everybody goes on with their day. This may be a superficial answer, but I think the public’s perception of debates are important: debates are understood to be a hallmark of democracy, so people pay attention to them even if they rarely have any effect on electoral outcomes. Turning away from what is perceived (right or wrongly) as an important part of the Greco-Roman democratic heritage American political culture continues to emphasize would be difficult. Debates are just for show. Especially in a political system like the US’ that is dominated by money(ed) politics, infused with rhetoric but with the essential substance of policies remaining unchanged, and infected with powerful interest lobbies backed by ludicrous amounts of corporate money. Nah. Just kidding. Well, sort of.